Sethuraman “Panch” Panchanathan doesn’t hesitate to speak in bold terms about the vast potential of the endeavors he will oversee as director of Arizona State University’s new School of Computing and Informatics. “We will be advancing the frontiers of computing and informatics, which will have a tremendous impact on almost every aspect of society,” he says. Panchanathan joined ASU President Michael Crow in September 2006 in hosting a symposium and ceremonies to officially launch the School of Computing and Informatics, part of the university’s Ira A. Fulton School of Engineering. The Fulton’s School’s Department of Computer Science and Engineering is incorporated into the new school, along with the Center for Health Information and Research and a newly created Department of Biomedical Informatics in collaboration with the University of Arizona. The department will be linked with the University of Arizona College of Medicine Phoenix Program at the new Phoenix Biomedical Campus. The already growing field of biomedical informatics is poised to change the face of health care in the not-too-distant future. “The application of informatics and computing to bioscience will enable physicians and other health care practitioners to replace ‘off-the-shelf’ medical treatments with courses of treatment customized for the individual patient,” Crow says. “Dr. Panchanathan, known with great affection and respect on campus simply as Panch, has been appointed to lead the school because he is a leader-scholar whose energy, vision, teaching and research make him uniquely qualified to design and advance the educational and discovery programs in a manner that will make the school an international leader,” Crow says. Panchanathan sees informatics having transformative effects on everything from business, technology, science and education to arts, culture and entertainment. 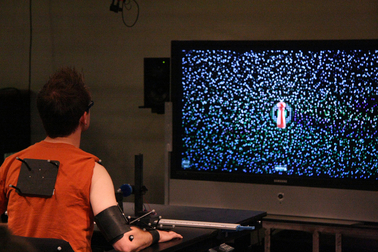 The rapidly emerging field far transcends computer literacy. “Computer literacy is about knowing how you get a computer to do the things you want it to do,” he says. Informatics literacy is about knowing how to use what computers can do to more efficiently locate, access, manage, store and effectively utilize data. Informaticians also understand how to better interpret, analyze, model and present that data. Informatics literacy provides tools to cope with a world of increasing information overload, Panchanathan explains. “It’s not just finding data but being able to assess the credibility and the value of information from the overwhelming amount of resources that are available, and being able to effectively put the information to productive use in whatever field you are working in,” he says. These “information fusion” capabilities, as he calls them, are going to become increasingly essential to economic competitiveness, scientific and medical advancements and even social and cultural progress — not to mention being one of the more significant career skills for the 21st century. “Companies such Intel, IBM and Google already are employing not just computer scientists and software engineers but also researchers who have informatics competency,” he says. Panchanathan, a tenured professor, has been chair of the Department of Computer Science and Engineering since 2003, when he also was named director of ASU’s Institute for Computing and Information Sciences and Engineering (InCISE). He is interim director of the Department of Biomedical Informatics and in 2006 was named professor-associate with the Department of Basic Medical Sciences, part of the University of Arizona College of Medicine Phoenix Program. 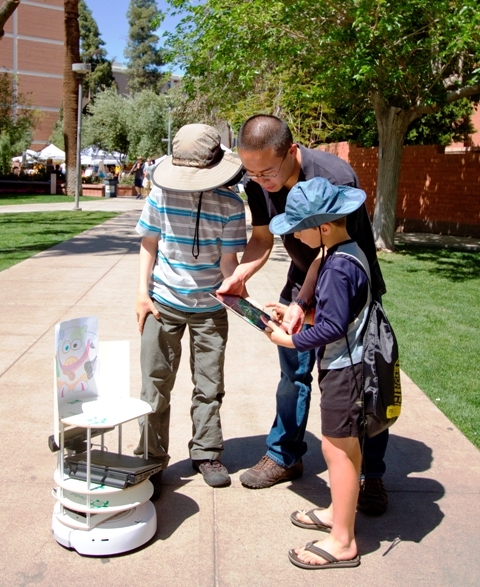 Since 2001, he has been directing the Center for Cognitive Ubiquitous Computing (CUbiC) which is focused on designing devices and environments to assist individuals with disabilities. iCARE, the flagship project of CUbiC won the Governor’s Innovator of the Year in Academia award in 2004. He is a co-founder and president of MotionEase Inc., an ASU start-up company, and a fellow of the Institute for Electrical and Electronics Engineers and the Society of Photo-Optical Instrumentation Engineers. “This is the perfect time to launch the School of Computing and Informatics,” says Paul Johnson, executive dean of Fulton engineering school. “We have an enthusiastic leader, a strong base in computer science to build from, significant investments from the state in the bioinformatics program, a new building in the downtown medical campus and a wide-open frontier of new computing and informatics challenges to address. “Panch’s vision for the integration of computer science and informatics with other disciplines has excited and attracted partners from inside and outside of ASU. There is a large demand for informatics-related training across a wide range of disciplines, and we are already seeing success with the funding of transdisciplinary research grants,” Johnson says. The trend is further signaled by the institutions signing on to collaborate with the School of Computing and Informatics, including Mayo Clinic, Barrow Neurological Institute, the Translational Genomics Research Institute (TGen) and Banner Health. 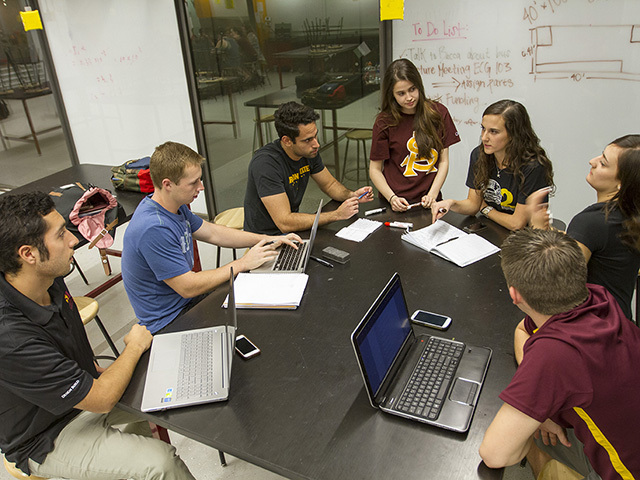 Within ASU, the new school will pursue informatics education and research in partnership with the Arts, Media and Engineering program, the School of Human Evolution and Social Change, the School of Life Sciences, the Department of Mathematics and Statistics, the Department of Psychology, the Biodesign Institute, the Global Institute for Sustainability, W.P. Carey School of Business, the College of Nursing and Healthcare Innovation, the School of Earth and Space Exploration, the Center for Law, Science and Technology and the College of Liberal Arts and Sciences. Eventually, the goal is to promote informatics literacy and competency within all of the disciplines offered at ASU. “At the core of this whole effort in creating a new school is getting students to understand that a career involving computing and informatics is fun,” Panchanathan says. Students will be able to major in computing and informatics, choose it as a minor area of study or get basic training through a certificate program. These options are designed to encourage students to combine informatics education with studies in every field — whether it’s biology or literature, archaeology or music. “They should not be apprehensive that informatics is something only for people who are good in math and sciences. This is an exciting field with great career and entrepreneurial opportunities, and it can be applied to everything,” Panchanathan said.